It is that time of year for the big game,snacks, beer and 'Super Bowl Sliders'. The Super Bowl is one week away and we need to get our game strategy together. Several of my fellow colleagues have been cooking pulled pork in the crock pot. This was inspiration to give it a Chilebrown twist. 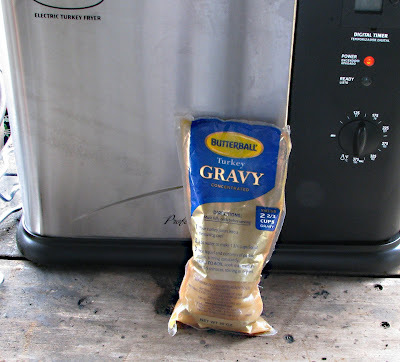 Over at the 'Meathenge lab', one of Reverend Biggles followers suggested starting the roast on the barbeque. 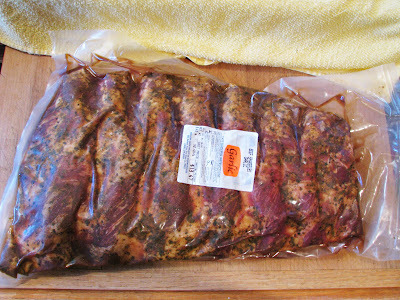 Our roast will start on the barbeque to infuse smoke into the meat. It then will be transferred to a dutch oven and finished in our kitchen oven at a 275 degree temperature. Once cooked it will be pulled apart and seasoned and reheated with some barbeque sauce. This scrumptious pile of meat will be served on some home made rolls with cole slaw. I feel a victory coming on. Our roast weighed 8 pounds. It was trimmed of the outer fat and seasoned with our secret rub. 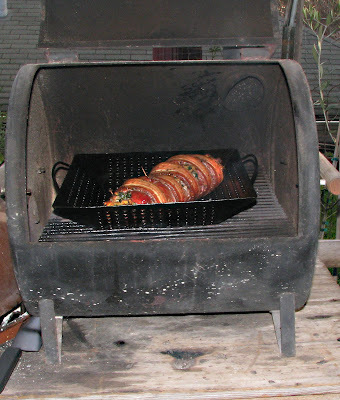 A hot mesquite charcoal fire will fuel the Weber. A handful of hickory chips was thrown on to the charcoals right before cooking. The meat was placed on to the grill and the lid was put into place. The meat was turned every 10 minutes for 40 minutes. 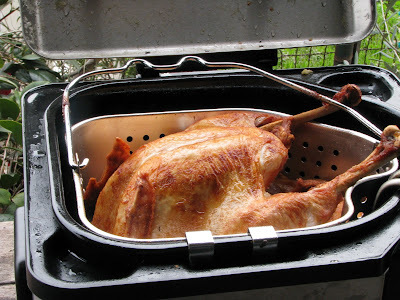 The roast was transferred to an enamel coated dutch oven. A trivet consisting of onions and carrots kept the meat off the bottom of the oven. A 12 ounce 'King of Beers' was poured into this cauldron of love. 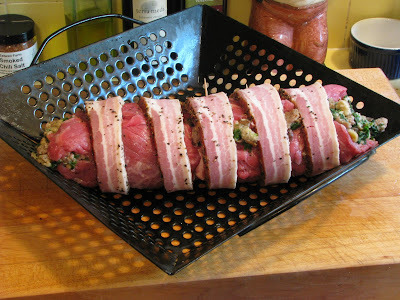 The talking meat thermometer was tucked into the roast and all was placed in the 275 degree oven. Four hours (190 degrees) later some lady started shouting French at me. I have no idea what she said but I took the roast out. 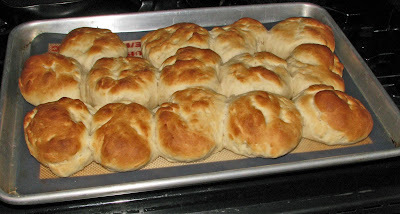 The roast was left to cool while the slider rolls baked. Combine yeast honey and milk together and let yeast bloom. Combine shortening and salted flour. Use a fork and cut shortening into flour. Combine all ingredients and knead for 10 minutes. Place into an oiled bowl, cover and let rise for 1 1/2 hours. Punch dough down and form into small round balls. 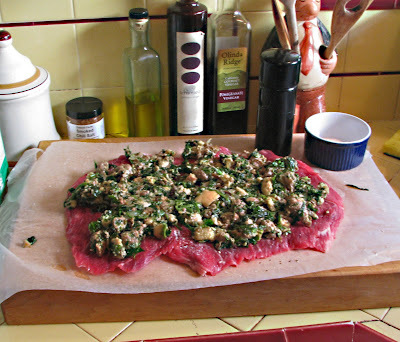 Place onto oiled cookie sheet and flatten your dough balls. Cover and let rise for 40 minutes. Bake in a 400 degree oven for 15 minutes or until browned. Take a proportion of your pulled pork and reheat it in cast iron skillet. 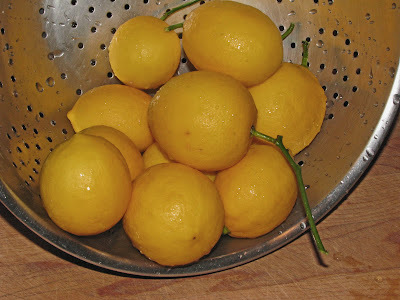 Add some salt & pepper and your favorite barbeque sauce. 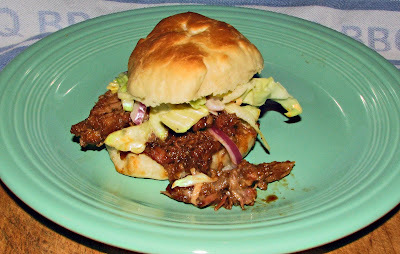 Serve this on your slider bun with some home made cole slaw. We have a TOUCHDOWN!!!!! The meat was smoky and oh so tender. With this method the cooking time was cut tremendously. 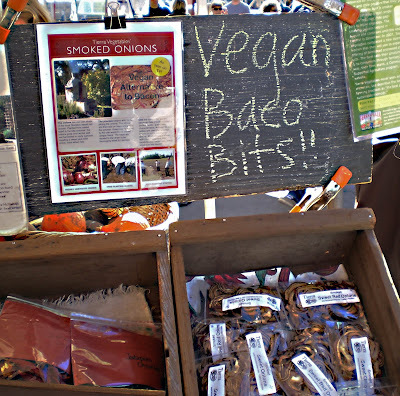 The only thing I miss is the bark (meat candy) that true smoking will create. 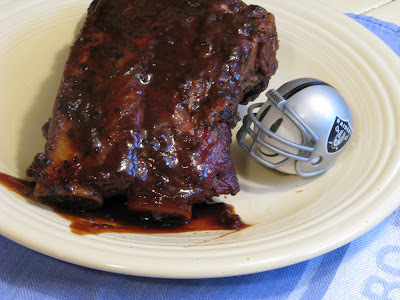 This will rock any Super Bowl party. The stage will be swept and dusted. 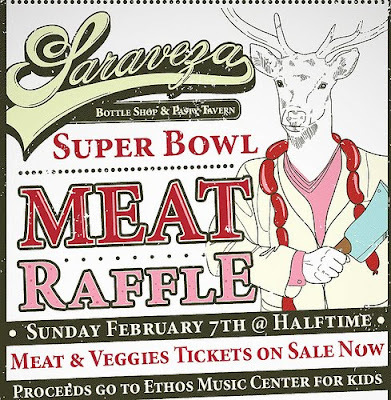 It has been a while since our last performance at the 'Bacon Revue'. Today's entertainment is a smoked bacon coated with black peppercorns. 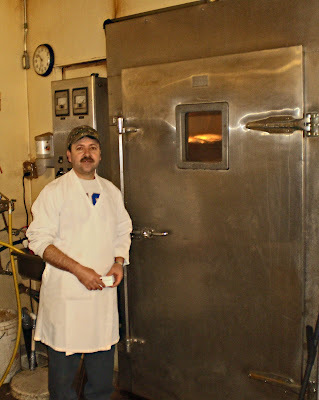 Our guest is from Willow Glen Meats & Smokehouse that is located in San Jose California. 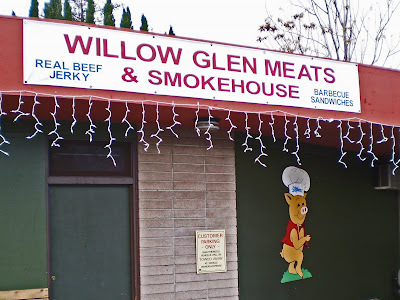 Willow Glen is a small local smokehouse located in an older residential neighborhood. 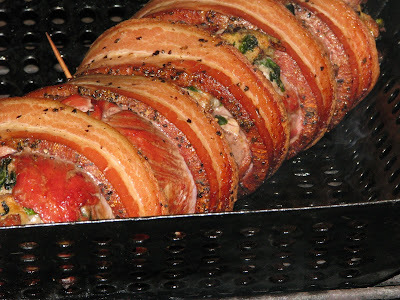 They smoke numerous meat products and offer three different styles of bacon. 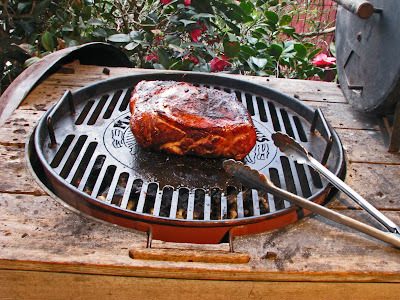 (Cajun, Smoked and Pepper) The pepper coated slab of pork will entertain and sizzle on the black iron of our kitchen. We will have a separate show with viewing and comments from our good friend the Reverend Biggles. The shrink wrap that protected our slab was removed and right away we noticed a lack of smoke odor. It is a good looking slab. The meat to fat ratio is very even. 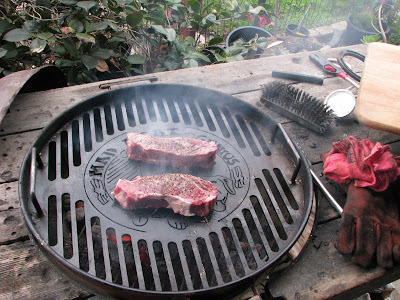 We break out our trusty black iron and cooked a couple of rashes. Ms. Goofy starts to drool. The smell of sizzling bacon is a wonderful thing. Now for the moment of truth. Salt was our first taste. We both agreed that it did have a meaty flavor. Even though the slab was covered in peppercorns we did not notice a pepper taste. Some components were missing. There was no smoke flavor or even a hint of sweetness. It did fry up nice and crispy and had a chewy bite. 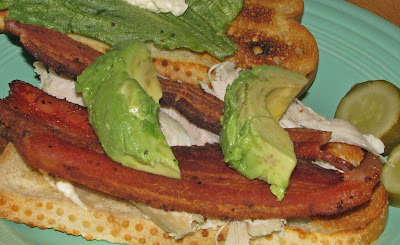 We tried some on a bacon, turkey and avocado sandwich. It tasted great in this sandwich. 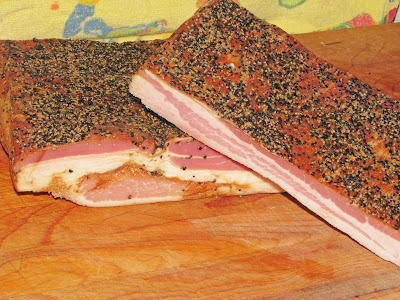 Reverend Bigggles had a cut of this 'pepper bacon' from the same slab. 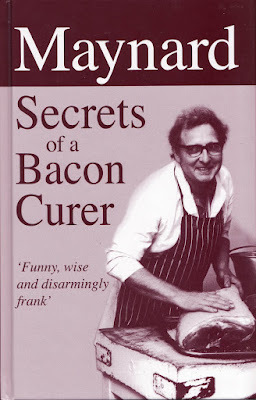 He cooked and tasted his bacon at 'Meathenge Labs'. The Reverend sent me this picture and the following comment. 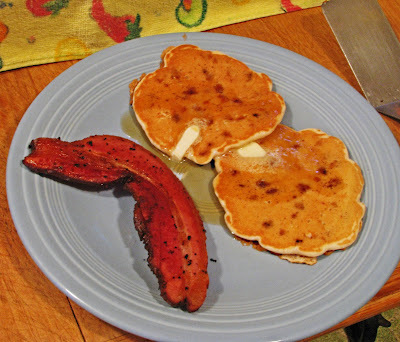 Uh, couldn't pull the peppered bacon out, wanted to do a post. But all I got was bacon texture and salt. No pepper flavors, no meat flavors, no cure flavors. Even the boys remarked pretty much the same thing. The Reverend and I both pretty much agree. 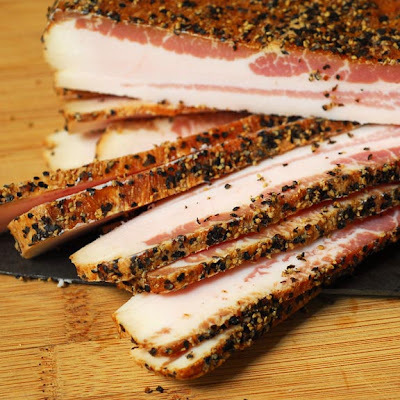 Today's bacon was missing smoke, sweetness, pepper flavor and was very salty. Bacon needs to be a good mixture of all these components. We thought it was meaty and it did taste good in our sandwich. Today's bacon from Willow Glen will receive 2.5 stars out of a possible 5 stars. 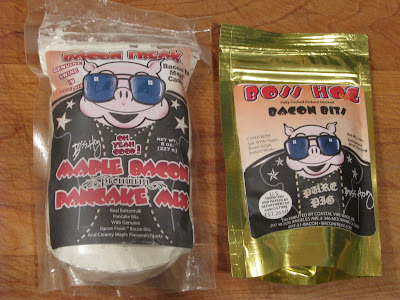 "Finally a pancake mix, fit for a real Bacon Freak!" These were the magical words to get my purchase. 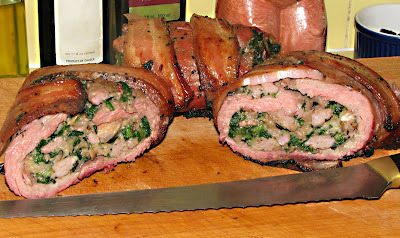 This crazy creation is the from BaconFreak.com. It sound just too good to be true. Well it was! 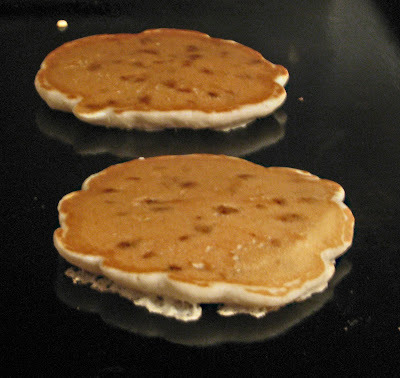 The pancake mix comes in two packets. There is the dry mix and a foil sealed bacon bits package. The instructions are simple enough. 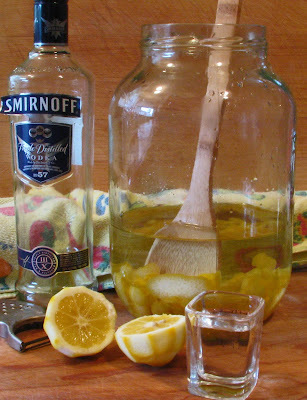 All you do is add one cup of water and stir. The bacon bits are then added. We fired up the griddle of our trusty Wolf and cooked some bacon on the side. You can never get enough bacon. The bacon bits package was opened first. We needed to try the bits on their own. Sure enough, they were little pieces of bacon. I popped one in my mouth and was hit with a salt bomb. They also had a little off metallic flavor. This was not the flavor we were craving. We went ahead and followed the instructions. The pancakes cooked very nicely. The pancakes did not hit the mark. The actual pancake batter was very tasty. It was sweet with maple flavor and almost cake like, like pancakes should be. The bacon bits just threw the flavor off. It is a good thing we cooked some bacon on the side. The 'pepper bacon' on the side was from 'Willow Glen Meats & Smokehouse'. (Bacon Revue next week). Next time, We will use our own bacon and ingredients just like real 'Bacon Freaks'. Mojo is excited. 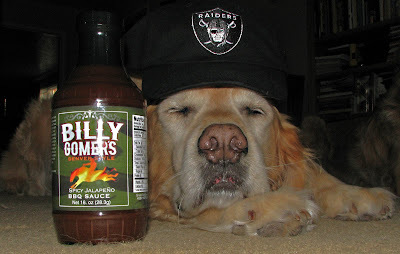 He is dreaming about trying 'Bill Gomers Spicy Jalapeno BBQ Sauce'. He will only dream while Ms. Goofy and I will be munching on some tasty grilled beef ribs smothered in this sauce. This sauce is very special because it was the spoils of a sports wager. Billy Gomers is a company based in Denver Colorado. 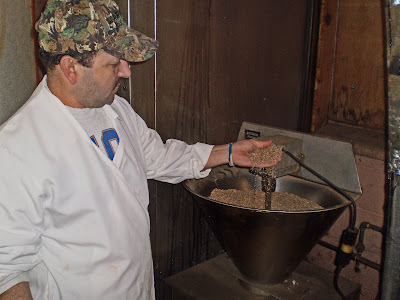 His recipe has been around for four generations of the Gomer family. Billy Gomer sells his sauce at local Denver farmers markets and just recently started selling at local Whole Foods markets. We tried a little sauce on the side before we commited to the ribs. It is tomato based that is sweet and tangy all at once. 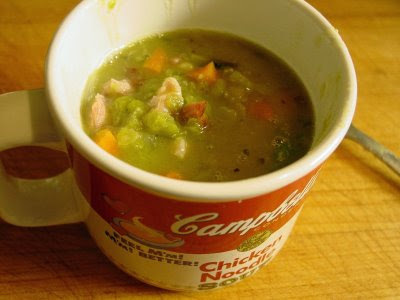 There are chunks of jalapeno throughout the sauce. We can taste a hint of smoke. The heat level is 2 out of 5. 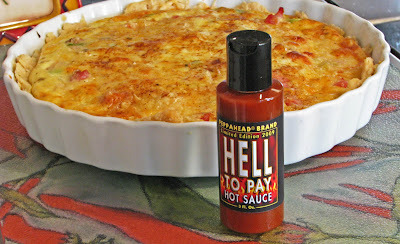 The heat grabs your attention and compliments the flavors of this sauce. We both agreed that this is one good tasting sauce. Of course the real test will be on the ribs. This was one tasty meal. The sauce complimented the ribs perfectly. Mojo was hoping for some leftovers but was disappointed. 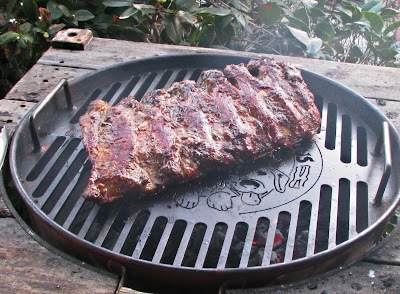 Billy Gomer has a sauce that stands out as delicious addition to the barbeque world. A special thanks to Lea Ann from Mangos chili & z for being a good sport and supplying us with this great sauce. 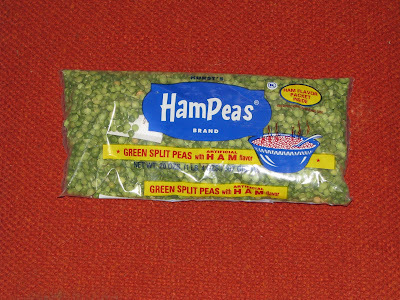 Check out the lastest review at "Peppers & More". Tito is the local barber in Rodeo, California. 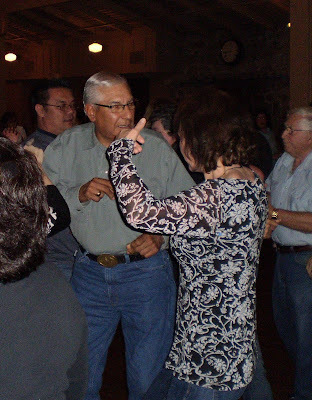 He is a great fisherman, He cuts our hair and can also dance like Michael Jackson on the dance floor. Tito knows everybody in town and is a local hero. These shots were stolen from the Crab Feed at the 'Crockett Bass Club'. 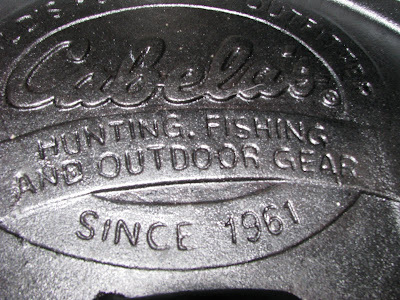 What does that have to with cast iron? Not a lot! 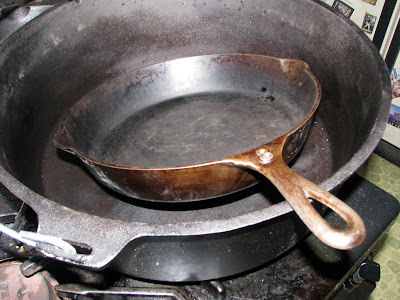 Check out my new pot. It is huge. Peppahead has created a masterpiece. “Everything you can imagine is real”. Larry, the Pablo Picasso of the pepper world has blended a slew of hot peppers to create this fiery hot sauce. This sauce will make you stand back to collect your thoughts and enjoy an artistic beautiful tasty burn. The colors of this canvas include Bhut Joklia, Dorset Naga and several other ingredients. This sauce is art in a bottle. Happy New Year! I am right on track with my New Years resolution. It has been seven hours and forty seven minutes of my diet. I will probably stay on track till 8oo. There is some great bacon in the ice cave that is calling me. While I am tossing my resolution into the black iron frying pan, there will be light from bacon candles. 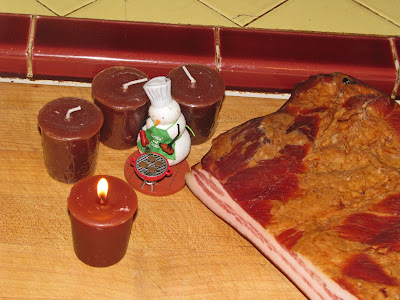 Kittridge Candles sells candles that smell like bacon. Who would of thunk of that. Of course some had to be acquired in the name of research. Yes, these candles do smell like bacon. It will never be a substitute for frying some of your own. With that said, Happy New Year and I hope you can keep your resolutions longer than I.